When we design parts, some simple changes can lead to a significant saving on the costs of machining a part. Therefore, understanding designs and how machinists operate will help you save a lot. If so, how to have Designing Cost Effective for your CNC machined parts. As one professional CNC machining manufacturer, Creatingway will share these knowledge to our global customers. Below arel tips for Designing Cost Effective CNC Machined Parts knowledge. 1. Make sure that the text is bold enough for easy reading. Ensure that lines are dark and colors such as blue, light grey and yellow are avoided. When you fax or scan a document with light colors the text becomes difficult to read. 2. Label your parts in a unique way so as to avoid possibilities of a mix-up. You should also be specific on the material to be used and the finishing. 3. Specify to the machinist the purpose for the part and how it will be used. It creates a vivid image of what you want from the machinist. 4. For complex parts, if possible, provide the machinist with a 3D modeling as well as a 2D printout. 5. Watch out how you use decimals when giving dimensions. Machinists will use the default number of decimals. When you put into consideration how your part will be machined it makes the workload easier on your pockets and the work of the machinist. 1. When designing make sure your design will avoid the possibility of an end mill chatter. 2. Make sure to avoid designing parts with corners that have the same size as the end mill diameter. 3. So as to reduce cost, when designing complex parts, design multiple parts that can be joined together after machining as it will be cheaper than machining one complex part. This is because one complex part involves a lot of risk by the machinist. 4. To ensure strength, the depth of the holes should be about 1-3 times that of the diameter. 1. Design in such a way that it will allow for vise fixturing. For this to happen it will require the part to have the possibility of being gripped by vise jaws. That is two parallel sides. 2. The other kind of fixturing is the soft jaw fixturing. It requires an extra step in machining but it is still cost-effective. 3. For the parts that do not need to undergo flood cooling, a fixturing that can work well is the use of double-sided tape. A large surface area will be required for the tape. 4. Steer clear of multiple setups as much as possible. Parts that have a single setup are less costly compared to those with multiple setups. When you make an order of similar parts at once, you will save on fixturing and reprogramming. You can also increase quantity when machining small parts to reduce cost per unit. Have a professional relationship with your machinist and also have regular and prompt communication. Pay your bills as required and consult the machinist on design matters. Request on ways of reducing on cost instead of bargaining on materials. You will likely end up with a good deal. 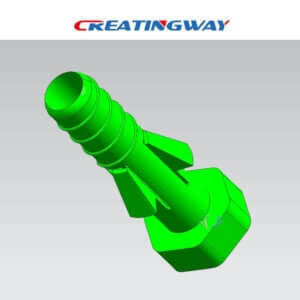 Creatingway is concentrate on CNC machining manufacturing, prototype machining, low-volume manufacturing, metal fabrication and parts finishing services, provide you best support and services. ask us one inquire now. How to Design Better Product Surface Finishing?